Your phone is important to you. It is a shiny piece of tech that is your lifeline for your connected lifestyle; be that a call for help, tracking your adventures or updating that social media status. If you love being outdoors as much as we do, you’ll want to protect it in the best possible way, with a waterproof phone case. If like us you will also be carrying other valuables, in separate bags, cases and pockets. Keys, cash and credit cards for example. We designed the waterproof phone and valuables wallet to meet our needs on our adventures. We wanted to carry our phones and other essentials in one easy-to-carry, handy wallet. The internal pocket keeps all our valuables separate and prevents our phones getting scratched. Like a waterproof phone case should, our wallet remains watertight* for up to 30 minutes at a depth of 1m (3.3 feet). It easily protects against rain, sweat, snow and ice, not to mention mud. If it’s gets dirty, simply wipe it clean or give it a rinse in clean water. The dust proof design means that on the beach or in the desert, our wallet prevents tiny particles of sand, rock or dust from getting inside. The high quality TPU film window allows you to use your phone’s touchscreen without the need to take the phone out of the wallet. The fully transparent window means you can see your phone’s screen in all its glory. Two internal pockets allows you to keep your phone separated from all the other important things you need to carry. Have peace of mind that coins, keys and other items won’t scratch your phone. Designed with lightweight fabrics and materials to ensure that you’re not carrying any more weight than you need. Available in two sizes to accommodate most phones, both sizes are designed to take up little more space than the phone itself. The second internal pocket has added volume to increase your essentials carrying capacity. We use 100% Nylon with Rip-Stop for the wallet outer. This means the wallet will pick up any scuffs and scrapes instead of your phone and valuables. A stiffer inner material protects your phone and valuables from each other too. The press-closure seal not only stops anything getting in, it also stops your items falling out. 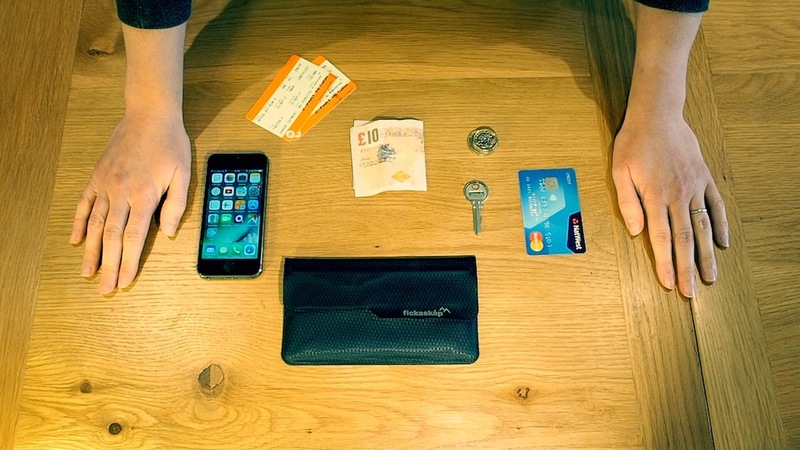 The internal pocket prevents your valuables from moving around inside the wallet. This wallet is IP67 certified. This means it is waterproof to a depth of 1m (3.3 feet) for up to 30 minutes. It’s also certified dust proof so there will be no sand, dust or grit getting in with your phone. WARNING: This wallet is only 100% waterproof and dust proof when the press closure is properly sealed. Fickaskap Limited accept no liability for damage when the seal is not properly closed. 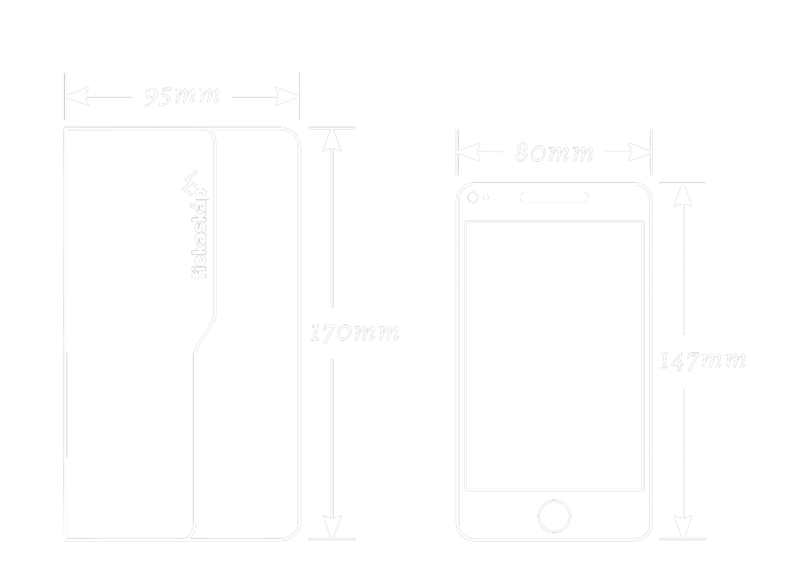 Will fit phones up to 147mm x 80mm (5.8 inches x 3.1 inches) such as Samsung Galaxy S7, Apple iPhone 8, Apple iPhone X, Google Pixel (1 and 2) and smaller. 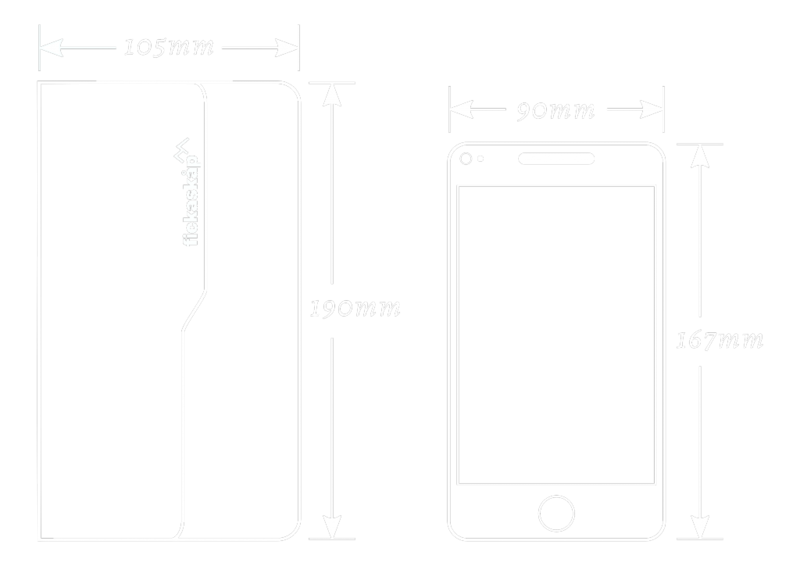 Will fit phones up to 167mm x 90mm (6.6 inches x 3.5 inches) such as Samsung Galaxy S8 and S8+, Galaxy S7 Edge, Apple iPhone 8 Plus, Google Pixel XL (1 and 2) and smaller. Sizes are a guide only, for thicker than average phones or for phones close to the maximum size but in a case, we recommend sizing up. Feel free to contact us with any sizing queries. We use the highest quality, technologically advanced materials such as 100% Nylon Rip-Stop and TPU films. Together with ultrasonically welded seams, these provide exceptional levels of protection and waterproofing to ensure your phone and valuables are kept safe and dry. Our wallet is ideal for those times when you don’t want to be carrying anything other than the essentials. Designed to perfectly fit into cycling pockets doesn’t mean it is just for cycling and mountain biking. 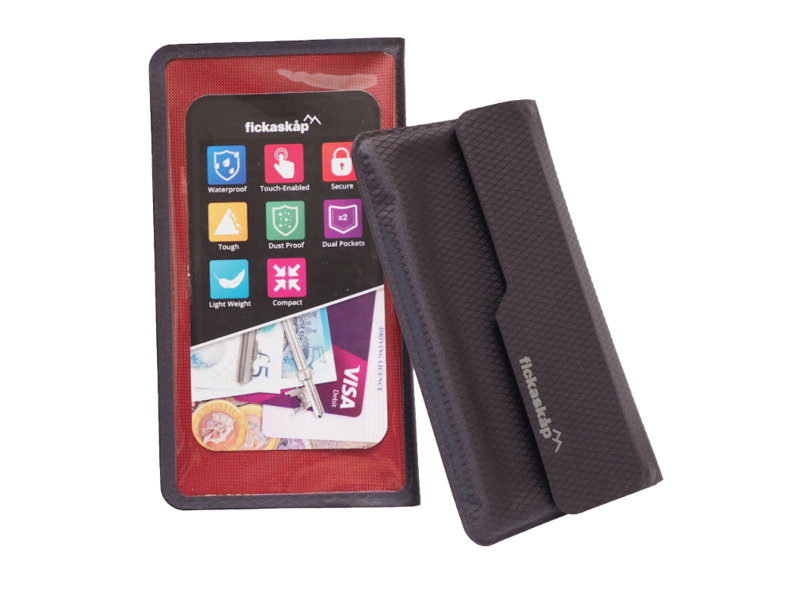 This multi-purpose wallet can be used for any outdoor pursuit such as; hiking, walking, running, skiing, snowboarding, canoeing, kayaking, stand-up-paddleboarding, surfing, sailing, wakeboarding, rock-climbing, gorge-walking, coasteering, horse-riding, fishing, dog-walking, bog-snorkelling and white-water-rafting. phew! What will you use yours for? All our products are extensively tested by our product development team in all kinds of extreme conditions. So you can rest assured that all your valuables are kept safe and dry whatever adventure you're on. At Fickaskåp we believe that high performance functionality shouldn’t be at the expense of stylish design. All our products are designed with this philosophy in mind. We know that style is equally important at café stops as it is on mountain tops. Practicality has it’s place too and you will love the design features that we have included. Our unique seal and fold design will stop anything getting in that shouldn’t. Yet the soft-touch velcro makes the wallet easy to open when you need to get in. We’ve tested this for you even with cold, wet gloves. Our plastic free packaging is 100% recyclable and has been designed to fit through most letterboxes. So you don't have to be in when we send it to you. "If you are looking for a case for your phone then we’d highly recommend it." "A waterproof, effective and convenient companion for your rides." "A convenient piece of kit that offers a cool alternative to the humble sandwich bag." "A simple and practical idea that could solve a common problem."